Two toy companies with very strong ties to each other. One cannot discuss Bullmark’s history without mention of the Marusan Toy Company. Marusan started business in 1950 as primarily a tin toy producer. The visionary company will go on to eventually produce the first Godzilla tin toys in 1964…followed by the first vinyl Godzilla toys in 1966. Marusan will suffer a brief bankruptcy in 1968, but re-open after a reorganization of companies in 1970…this is the year that the struggling toy company will shift it’s focus from vinyl toys… to Original Equipment Manufacturing (OEM). In 1969 , during Marusan’s reorganizations, Koutaro Ishidahe, the nephew of the Marusan president, and two other ex-Marusan employees open a new toy company… Bullmark. Bullmark, armed with Marusan’s license to produce TOHO kaiju vinyl toys (some using the original Marusan molds), represented the Japanese monsters in a very stylized manner with uncharacteristic colorways. This artistic sculpting style and free use of color made the toy company famous to collectors and toy buffs to this day. Vintage Bullmark and Marusan kaiju vinyls can command thousands of dollars today. Today many of Bullmark & Marusan original molds are used to produce vinyl reproductions. Companies such as M1-ichigo & the giant Bandai, have recreated vintage Bullmark toys from the 1970’s. The more stylized kaiju vinyls are definitely my favorite…I simply love the tactile experience of holding them and the vibrant colorways. Often many color styles exist for any given figure. As an example… some were made especially for the Hawaiian market that feature a very exotic color palette…with an emphasis on pink. Bullmark closed its doors in 1977 while Marusan endures…back in the vinyl toy business. Click Gojira to see more in the gallery or enlarge. 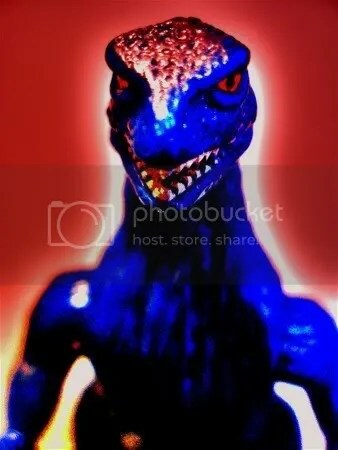 This entry was posted on July 18, 2008 at 1:52 am and is filed under The Kaiju Art Collection, Toy Reviews with tags bullmark, godzilla, HDR photography, japan, Kaiju, marusan, monsters, toys, ultraman, vintage. You can follow any responses to this entry through the RSS 2.0 feed. You can leave a response, or trackback from your own site.